In a performance that was as remarkable as it was messy, Al Hrabosky and the Cardinals turned the last home game of the 1974 season into a classic. 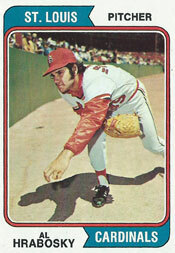 On Sept. 25, 1974, Hrabosky struck out nine in 6.1 innings of relief against the Pirates at St. Louis. Hrabosky’s effort was among many dramatic, unusual feats in a 13-12 victory that gave the Cardinals an edge in their pursuit of a National League East Division title. “Never in my life have I seen a game like that,” Cardinals first baseman Joe Torre told the Alton (Ill.) Telegraph. The Cardinals entered the game that Wednesday night trailing the first-place Pirates by a half-game with a week remaining in the season. Rookie right-hander Bob Forsch, who started for the Cardinals, gave up five runs in the first inning before being yanked. Because the Pirates had stacked their lineup with left-handed batters _ Richie Hebner, Al Oliver, Willie Stargell, Dave Parker and Ed Kirkpatrick _ Cardinals manager Red Schoendienst went with left-handed relievers. First, he used Rich Folkers. Then, Claude Osteen. The Cardinals rallied for six runs in the third off Ken Brett and Larry Demery. In the fifth, the Pirates got a run against Osteen, tying the score at 6-6. The Pirates had runners on first and second with no outs when Schoendienst replaced Osteen with his third left-handed reliever, Hrabosky. Hrabosky got the Cardinals out of that jam without either runner scoring. In the bottom of the fifth, the Cardinals scored three, taking a 9-6 lead. The Pirates scored twice off Hrabosky in the sixth. Entering the ninth, the Cardinals clung to a 9-8 lead. Hrabosky struck out Stargell, but hit Parker with a pitch. Manny Sanguillen singled and, when center fielder Bake McBride made an error on the play, Parker raced home, tying the score at 9-9. Hrabosky struck out at least one batter in each of the seven innings he worked. Hrabosky gave up three runs on three singles and a double before he was relieved by Mike Garman with one out in the 11th. Hrabosky’s line: 6.1 innings, 6 runs, 10 hits, 0 walks, 9 strikeouts. The innings, runs, hits and strikeouts are single-game highs for Hrabosky in his 13-year big-league career. Garman retired the two batters he faced, but the Pirates led, 12-9. “We knew where we were at and it was now or never for us,” Torre said. The Pirates had used five pitchers, including their two best relievers, Dave Giusti and Ramon Hernandez. Pirates manager Danny Murtaugh brought in rookie Juan Jimenez to nail down the win. Ted Sizemore led off with a single. Reggie Smith walked. Ted Simmons was up next. “I figured if he walked Smith I was going to swing at the first pitch in the strike zone,” Simmons said. Simmons launched a double to right, scoring Sizemore and cutting the Pirates lead to 12-10. Murtaugh lifted Jimenez and replaced him with another rookie, Jim Minshall. The first batter he faced was Torre. “I wanted to hit the ball the other way to at least score Smith (from third) and get Simmons to third base,” Torre said. Torre hit a broken-bat grounder to the right of second base. Rennie Stennett, the second baseman, fielded the ball, but his throw to first was wild. Smith and Simmons scampered home, tying the score at 12-12, and Torre advanced to second. Larry Herndon pinch-ran for Torre. McBride bunted for a single and Herndon moved to third. Ken Reitz struck out _ the first out of the inning. Due to bat was Jack Heidemann, a light-hitting shortstop. Schoendienst sent Jim Dwyer, a reserve outfielder batting .282, to pinch-hit. Dwyer lifted a sacrifice fly, scoring Herndon from third with the winning run. The improbable four-run uprising gave the Cardinals a 13-12 victory and propelled them into first place. The Cardinals would win three of their next five. The Pirates, though, would win five of their next six. On Oct. 2, the final day of the season, the Pirates held a one-game lead over the Cardinals. To finish in a tie and force a playoff, the Cardinals needed to beat the Expos that day and the Cubs needed to beat the Pirates. Instead, the Pirates beat the Cubs, 5-4, in 10 innings. The Cardinals-Expos game was called off because of rain and wasn’t rescheduled. The Pirates were NL East champions, finishing 1.5 games ahead of the Cardinals.